As authorized by Section 551.071(2) of the Texas Government Code, this meeting may be convened into closed Executive Session for the purpose of seeking confidential legal advice from the City Attorney on any agenda item listed herein. Items are listed on the Consent Agenda by the City Manager and are recommended to the City Council for single vote approval. An item( s) may be removed from the Consent Agenda for separate vote at the request of a Councilmember, the Mayor, or the City Manager. 1. Consider Zoning Case Z-1381-18; a change in zoning from General Retail (GR) to Office-1 (O-1); and adopting Ordinance. The property is located at 400 North Hampton Road which is east of North Hampton Road and approximately six hundred and sixty (660) feet south of East Lanett Drive; consisting of 0.736 acres out of a larger lot. Applicant: Tony Boyd; Property owner: Hampton Road Baptist Church. The Citizen Appearances portion of the Agenda is an opportunity for the public to address the City Council on any subject. However, in accordance with the Texas Open Meetings Act, the City Council cannot discuss issues raised or make any decision at this time. Issues raised may be referred to City Staff for research and possible future action. Pursuant to Texas Government Code Section 551. 0415 the City Council may report on the following items: ( 1) expression of thanks, congratulations or condolences; ( 2) information about holiday schedules; 3) recognition of individuals; ( 4) reminders about upcoming City Council events; ( 5) information about community events; and ( 6) announcements involving imminent threat to public health and safety. The building in which the above meeting will be conducted is wheelchair accessible. Person with disabilities who plan to attend this meeting and may require auxiliary aid or services such as readers or large print, or interpreters for persons who are deaf or hearing impaired, are requested to contact the Office of City Secretary at 972-230-9646 or by E-mail at kmorris@desototexas.gov or by calling through a T.D.D. (Telecommunication Device for the Deaf) to Relay Texas 800-732-2989.
a place convenient and readily accessible to the general public as well as to the City's website www.desototexas.gov and said Notice was posted on the following date and time: Friday, August 31, 2018 by 5:00 P.M. and remained so posted at least two hours after said meeting was convened. 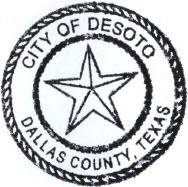 DeSoto City Council Meeting are broadcast live in their entirety on DeSoto's City Website www.desototexas.gov Government Access Channel 16 available to Time Warner subscribers on the first and third Tuesday of each month at 7:00 p.m. A taped broadcast is aired each day on Channel 16 at 10:00 a.m., 2:00 p.m., 7:00 p.m., and 11:00 p.m. following the live broadcast. Question regarding the broadcast schedules should be directed to Kathy Jones, Community relations Manager, at 972-230-9648. These taped broadcasts are also available to view on the City's website (www.desototexas.gov ) at your convenience. Questions regarding the Internet viewing of these meetings should be directed to the Office of the City Secretary at 972-230-9646.